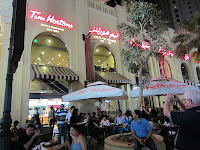 On my visit to Dubai with B, I was surprised to see Tim Horton's locations everywhere! The offerings are the same as what you'll find back in Canada - coffee and baked goods. I was hoping to bring Mark back a Tim Horton souvenir mug with the name in Arabic but unfortunately there was nothing to be found. It would have made the perfect souvenir for my double-double addicted husband.